Travelling and wayfaring are two of the themes that each of these poetry publications share, with reflections on the physical and spiritual journeys that we all make in the course of our lives. 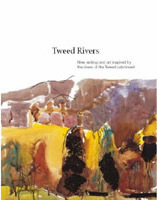 Tweed Rivers, ‘a guidebook for the imagination, and for anyone who loves the rivers that flow into Tweed’ is a rich, imaginative publication itself, which brings together the work of contemporary poets, storytellers and visual artists. Inspired in part by E.V. Lucas’s 1899 anthology The Open Road: A little book for wayfarers, the current anthology extends the site-based work of the more recent Tweed Rivers Interpretation Project. ‘River catchments are not always obvious, but they shape identity and forge connections in ways that transcend politics’, and here the journey that the waters of the Tweed make from source to sea is given a different kind of permanency in words and images. Writing from established poets such as Gavin Bowd, Colin Donati and Valerie Gillies sits alongside the work of emerging writers. Dorothy Alexander’s fishy short story ‘Life is Sweet’, un-nostalgically recalling childhood, eulogises the Innerleithen trout, how to catch it and how to eat it, with the fingers, ‘with its coating of fried oatmeal’. Visual artists complement these interpretations in various media: etchings, woodcuts, watercolour and pinhole photography. In his eleventh collection, W.N. Herbert demonstrates with characteristic flair the versatility of his range, from short pieces to more extended sequences and prose-poems. Again, many of the works here concern themselves with impermanency, identity, history and change. Herbert is of course very much at home writing in Scots or in English. Although this collection happens to contains more in English than in Scots, it seems he has kept in reserve his best for the extended sequence ‘Rabotnik Fergusson’, a version of The Divine Comedy, itself a kind of travelogue. A dramatic meditation on both the status of Scottish poetry within the literary tradition and the place of poetry within the cosmos, it opens with the Edinburgh poet Robert Fergusson awaking ‘in Hell/or mebbe Heaven – wha can tell?’ with some robotic drone for his Virgil-like guide, except this one has a Dundee accent. On his travels through this hellish region, Fergusson meets the shades of other Scots poets and makars who are at this infernal place ‘fur thi sin/o verse that isnae Anglophone.’ The list of sinners is impressive: Blind Harry, the anonymous balladeers, one or other of the Wedderburns, Mark Alexander Boyd, Alexander Montgomery, James Hogg, the great William MacGonagall, and even a glisk of CMG himself. Those poets assigned speaking-parts rehearse their dooly fate to Fergusson, until in the ‘Song of the Index of the Spheres’, the destiny of all poetry is revealed, ‘dye ken there’s never hope o port?/we’re poems in a sea o prose.’ And in the final section, ‘Shanty of the Sailors’ Moon’, we learn, as Fergusson does at the conclusion of his odyssey, that as ‘we sail tae kingdom come’, all will end in silence. This is a hugely inventive piece of writing: because he is writing about the Scots poetic tradition, Herbert resurrects the verse-form of the ‘Standard Habbie’, used by Ramsay, Fergusson and Burns, and by earlier poets before them. In a typical gesture of bravura, Herbert dedicates one section of the poem, ‘A Habbie History’, to this worthy stanza-form and eulogises the ‘Habbie’ using the stanza-form itself. ‘Here comes the bauld stanzaic lore/that maks aa modernistics snore:/a man caad Sempill fur a splore/wrote ‘Habbie Simson’,/a piper’s elegy – and more:/oor bards saw crimson.’ A verse-form peculiar to Scottish versification, the ‘Habbie’ has been regarded by some as artistically inferior to, say, the sonnet form. But the ‘Habbie’ is as versatile as any other form: ‘it’s hauf-lament and hauf in play/that gees the twist:/a fact that in his morbid lay/auld Wordsworth missed.’ And its use brings with it its own demands: ‘It maks ye rax for far mair rhymes/at a faster pace than the sad hauf-mimes/o normal formal verse: its chimes/can syncopate;/it’s bagpipe ragtime, bop’s sublime/Scots drinkin mate.’ This sustained use of the form to describe the form, in fact the entire poem, is something of a virtuosic feat and is entirely Herbert’s own contribution to the writing of the music, or the silence, of the spheres. With Nairn’s publication comes a flyer, which reads: ‘Understanding Edinburgh Festival Fringe Events. You are invited to attend and to read your work at the 2006 Understanding Edinburgh Festival Fringe Events, at 1 Haymarket Terrace, EH12 5EY on 19 August at 7.30pm.’ Presumably the ticket price is included in the cost of the book. In for a penny, in for a Pound. Despite his reportedly saying to Ginsberg towards the end of his days, ‘the worst mistake I made was that stupid, suburban prejudice of anti-Semitism’, Ezra Pound will be remembered as much for his crass stupidity as for ‘the long shadow his poetry has cast over literary modernism’. According to the poet and critic Michael Alexander, Pound was ‘the counsellor of Yeats, the discoverer of Eliot and the impresario of Joyce’; indeed Eliot regarded Pound as ‘the better craftsman’. But like Pound, Eliot too had peculiar, if not distasteful ideas about some things. Ezra Pound in His Time and Beyond was produced to accompany an exhibition of the recently acquired Ezra Pound collection of the bookseller, collector, publisher and writer Robert A. Wilson, by the University of Delaware Library. It includes copies of Pound’s extremely rare first two publications, manuscripts, photographs and ephemera. Beautifully produced, it contains minuscule opuscules on the poet and his life, including Pound’s Own Influences and Forebears; William Carlos Williams and H.D. : The Penn Years; London, Yeats, Wyndham Lewis and Others; Joyce, Lawrence and Frost; ‘A Heap of Broken Images’: The Waste Land; The Paris Years; Pound and Little Magazines; The Cantos; World War II, The Pisan Cantos and St Elizabeths; and After Pound. 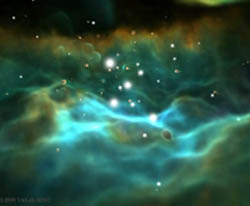 Credit to the San Diego Supercomputer Center for the photo of the Orion nebula.